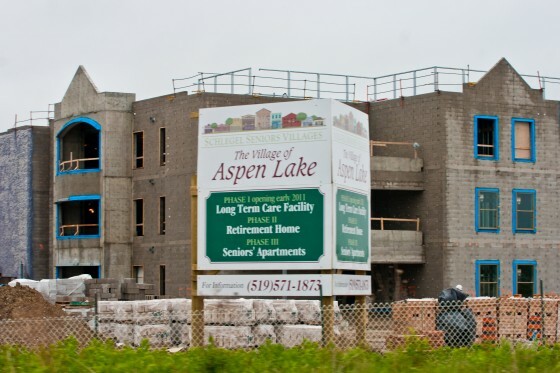 The multimillion dollar “Village of Aspen Lake” retirement home by the WFCU Centre in East Windsor is nearing structural completion. The massive medical and care complex will be constructed in three phases, with the first phase a 192-bed long term care facility set to open in January 2011. The Village of Aspen Lake forms part of the adjacent Aspen Lake subdivision, named for a man-made body of water near Little River and McHugh street. The facility is one of eight long term care facilities owned by Dr. Ron Schlegal, founder of the Ontario Research Institute for Aging.